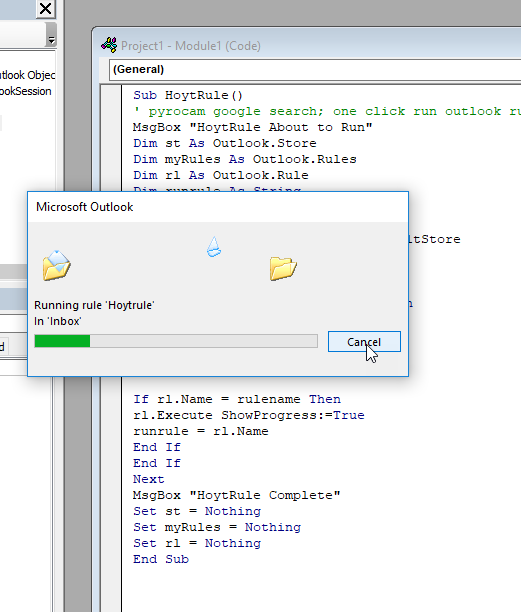 I was asked how a user could manually run all or a single rule, without having to use the outlook rules dialog box. here is how you do it. NB: if it doesnt work at first, as per this comment you may want to try replacing the “s with your own. It’s possible they are lost in translation. This will create a new macro that runs all the rules one by one in against your inbox. The toolbar will be created floating, you can drag this now where you want it in the client. or leave it alone for now. then go into the Commands Tab, scroll down to Macro’s on the left hand side, you should see Project1.Runallinboxrules in there. drag that up to the new toolbar and release it. This will make a new icon to the macro. the single rule name macro doesn’t work..
the all rules macro does.. The single one didn’t work at first for me. Then I noticed the quotes were funny looking from the code I copied. Try deleting the quotes then replacing them by typing them in. They must have copied over incorrectly but changing them worked for me. Thanks for the code it works great! Is there a particular reference that needs to be checked in the Tools | References… menu? have you got some rules setup? what version of office are you using? what is the error message? Hi John! I worked out the problem by setting my Macros security level to low. This store does not support rules. Could not complete the operation. sounds like it cant logon to the store properly, are you running it from within outlook, or an external script? you could try starting outlook in safe mode (start , run, ‘outlook.exe /safe’ ) and running it, to see if its an addon thats causing the issue. GREAT !!! this is exactly the shortcut that I was looking for. How can I apply this macro to execute on a pst file (let’s say mySpecificeMails.pst) instead of inbox folder? I get compile errors when running the rules macro: user defined type not allowed. Are there files I need to include and how do I include them? There are no files or references required, what line is highlighted when it gives the error? The all rules one worked for me after I changed the ‘ but it only runs rules from my Exchange account, not the account I am in or all accounts. To clarify, I’m connected to Exchange and 2 IMAP accounts. The run all rules script runs the exchange rules but not the IMAP account, regardless of which account folder I’m in. Using Win 7 Pro 64, Office 2010. Awesomeeeeeeeeeeeee. thanks works like a charmmmmmmmm. Note type in the quotes cause when you copy paste the quotes change. Ok got an issue. It just ran once and stopped working. I also had the same problem as john. When I tried to run in safe mode no macros could be run. Hi, Got a question trying to use your script to disable only one rule. But this isn;t working, I’m complete new to this, so hope you can help. Underneath is hat I tried. Thanks in advance. Is it possible to designate more than one (but not all) rules with this method? I’m a non-coder, but i follow instructions REAL well. Any solution for the 0x90020009 error with an IMAP setup? 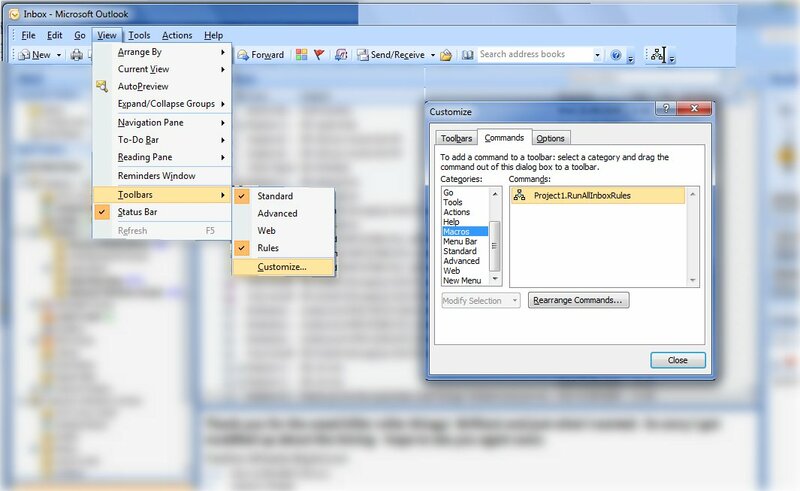 Outlook 2010 can sync with a gmail account, but neither the All Rules or Single Rule macros will run. They both work fine when I use them on my work account since that uses Exchange Server. It’s working perfectly! However, I’d like to run this only on “Read” messages. Any ideas? Thank you! The above macro template proved very helpful for Outlook 2007 rules management (my 385+ rules are manually run at least once daily) – thanks !! Note 1: Using trial-n-error (I’m a macros novice), I made minor revisions to add “Ready” and “Done” message boxes (see revised template below). Note 2: To enable this macro, the Outlook 2007 Macro Security Setting may need to be switched to the following option: Tools >> Macros >> Security >> “Warnings for all macros”. I put the e-mails I have answered into a DONE subfolder and then use my rules on the DONE folder. Is there any way this code can be adapted sot hat all of my rules in the Rules Wizard run on the subfolder and not the Inbox? … but it still doesn’t work on SENT rules. 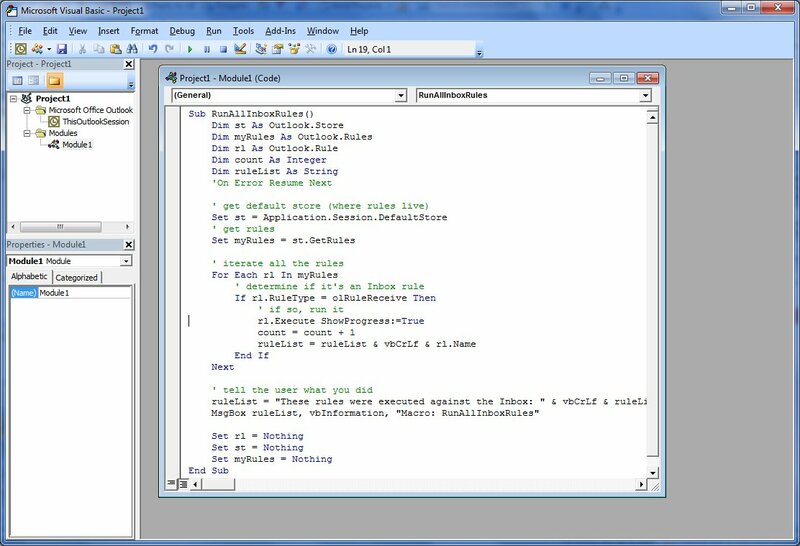 I found a solution to the Outlook 2010 error “This store does not support rules. Could not complete the operation”. “This store does not support rules. Could not complete the operation”. I Have multiple in boxes and this run on the my personal one but not on the server I need to run them manually can someone show me how to modify the code or where to modify it to make it work on all inbox I have access to ? BTW – Just tried the ‘RunAllRules’ module with Outlook 2013 Preview… seems to work well (a little slower than the native Run Rules Now (and selecting all) but does the job! I use the Run All rules command frequently against my primary inbox, thank you. I want to evolve it a bit and need some help. I want to run 5 specific rules against a shared inbox, attaching it to a macro. How do i get the code to run it against a specific folder? Worked great! Exactly what I needed. Thanks! This of course is very helpful to filter shared inboxes. I found it was necessary to add the cf refinement to make this otherwise brilliant macro work. Thanks, This works like a charm. But how can I run this only for the unread mails in the selected folder? That would make things faster ya? LOVE IT!!! I made a few tweaks for what I needed but couldn’t have done it from scratch. Thanks so much for sharing. This is just what i’ve been looking for,m however, I can’t get it to work. When I click the button ( correctly assigned macro) it does absolutely nothing. No error message, nothing. I’m using Outlook 2010. In the macro itself, are the comment lines preceded by the ` next to the number 1 or the ‘ near the return key please? If I copy and paste the code above, I get red comment lines, if I replace the ` with a ‘ then I get green lines. Either way, I can’t get it to work anyway. Thanks! Made my mail administration so much easier. Funny that such toolbar shortcut is not default in Outlook. Just found your site after looking for this very type of code. It runs flawlessly (no errors) and prints out each rule I have, however it does not actually execute the rules. Office 365 2013 Outlook. Any ideas? Thanks. Never mind. I had the wrong Inbox selected when running the script. Works great! Thanks. and the first line of the code “Sub RunAllInboxRules()” get’s highlighted in yellow. Can I select folder other than Inbox to run the rule against? I see there are couple people asking this question, but no answer. Perfect, thanks. I had to replace the ‘ not the ” but then it ran great. Hi everybody!… I need to create a macro that backup all rules from outlook 2010 (client and server). Works great and your detailed instructions were an exceptional example of good documentation. Again, many thanks. Brilliant. I removed the two lines that open the dialog box at the end and still worked flawlessly. Thanks very much for this, really useful. Would anyone know how to modify the code to EXCLUDE one or two rules, but run all the others? Outlook 2010, with multiple IMAP accounts. I received the following error: “This store does not support rules. Could not complete the operation”. That worked for my default IMAP account. It is now running smooth ! Thanks for your post, I was struggling with this too and had already tried “Application.Session.Stores(1)” using Application.Session.Stores(2) worked for me. Is there a way to specify which set of rules per mailbox? I have 2 mailboxes, with different sets of rules and I only want to run the one mailboxes worth. Outlook 2013. Looks like this post was copied directly from an outlookcode article posted 31-MAY-2006. A link or mention of the original article would be a good idea. How can this be modified to run a single rule on all of the folders (and their subfolders) within the inbox? Sorry about the link btw. I figured that rule was just to prevent advertising, so I put *’s in it so I could show you the picture. Thanks a lot man !!!!!!!!!!!!!!!!!!!!! i was just looking for it…worked like a charm ! just had to replace & retype single and double quotes again as macro was not working fine when i copied the code. Sorry Jeff I am no longer actively supporting this. I can’t see anything wrong with your code. Although just to confirm, the lines that start with ‘ are green (these are comments you can delete them and you replaced every ” with a your own ” right? Is there any code outside of the sub …. end sub ? there shouldn’t be. hello i need some assistance with the above. Thank you!! ‘if you have more than two. I see this is no longer “actively” supported, but I am seeking to automate processing a select group of rules. I would like to create a new rule that upon execution will run a script or batch file that then executes said rules. Like so many others I get a lot of alerts and when away from my computer, it would be nice to move those out of the way so I can see more important messages. have the rules process and my working inbox (not the default inbox) cleaned up by moving alert messages to their archive folder. I am comfortable with batch files, but not scripting. I never got this working, but I added three lines to the script so that hopefully three rules would run (I saw the next hoping that would work). I have also tried naming the script *.vbs hoping I could fire it from explorer, but that did not work either. Some means of remote firing this would just be the bomb, but I would want to setup multiple variations so that I could run rules 1-3 and or 4-5. At this point I’d not need to run more than 5 rules, but of course if this was to work that could change. Thanks to anyone willing to assist! P.S. I LOVE the captcha replacement below! – I SO HATE those things as I constantly have to re-enter them! could some bright spark write a macro that scans all rules, creates a macro for each rule (using the one already provided here as a template), then (if the toolbar doesn’t exit) creating the toolbar and adding all the ‘rules macros’ to it? Hopefully it can just add new rules macros if it’s re-run later, checking first which rules already have a macro for them (get list of rules, look for macros that reference them, probably have a standard name here! “apply_” for example), and only continue for the ones that don’t exist. /kb/983265 although this doesn’t seem to match up with what your seeing. If you know how code works a little, try deleting blocks of code until you find the one that’s causing the issue. Yes, I only searched for the error code, along with “automation error” and VBA and got nada. The problem was with one of my rules, which somehow ran manually, but not in the macro. I added Print statements and logged the loop iterations, while moving rules around until I found it. Phew. I’m gonna really like this one-click rule running. Thank you! Hi thanks for this. Mine works but doesn’t actually FIND any rules to execute. I suspect my rules are being “stored in the wrong place” as I have, over years, gone through a series of Windows and Office upgrades, and now on MS Office Home and Business 2016 (installed locally, paid, not web-based) under Windows 10, with all updates current. Any ideas how to find where my rules are actually being stored, and either change that, or point correctly within the macro? PS: what I have tried: recreating rules from scratch. On my current laptop Windows 10 was pre-installed, and ONLY Office 2016 was ever installed (not upgraded). Windows updates are turned on automatic and up-to-date. 8gb RAM, I7 lots space, new machine. When I run the macros I get the success message, but no rules are listed. In other words “runrule” is empty. Appears as “” when I step through. No error messages. Sorry, one more thing; my email is now IMAP/SMTP, Would that affect where the rules are stored? Windows profile path: c:\users\myname\appdata ..\applicationdata ..\documents ..\local settings etc. 2. I mentioned the clean install of Windows and Outlook, however, to preserve settings, defaults and data, after purchasing this laptop with Windows 10 but BEFORE installing Office 2016 I did a selective but thorough copy of my user profile from a previous Windows 7 machine. Prior to that copy I had done a “squeaky cleanup” of that machine with ccleaner64. The Win 7 machine never had any problems (occasional overheating caused me to replace), and the Windows 10 machine has never had any other problems or significant glitches or hiccups since. I think there must be a registry key that tells Outlook where to store rules, and yet another that is accessed when they are run from macro, and I have a mismatch? How do I find that? I just searched the registry for my rule name but did not find. it will do a popup for each store (numerical ID) and how many rules are in there. Alas it finally found the 2 rules (per the message box) but it did not succeed in re categorizing the email. When run “manually” it did, so I know the rule itself is still correct. I am missing something, but what? does the progressbar popup show up at all? 2. No, no progress bar — when run manually it does show progress bar for some time as the inbox is large (>1000 messages), but always completes correctly after about 50 seconds. Note I had rerun the “rule store macro discoverer” and the mail store number changed from 10 to 2 (so I adjusted the primary). Note I have rearranged the “folder pane” so that may be the cause of this? It’s worked perfectly in outlook 2010. Now I’ve migrated to the outlook 2016 and simple copy paste. It does it’s work but…. when I press debug “Next” is pointed in yellow. Can anybody help me and solve this issue? cause I’m not a Visual Basic aware user. I’ve tried both the original script from Pyrocam and the alternate script from Sebastian. I am running on Outlook 2016 Exchange (Office365). Both produce a Syntax Error with the first “Sub” line highlighted in yellow. I have done the replacing of quotes as recommended. I’d really like to make this work as I need to run my (rather large) set of rules frequently and due to the silly limitations of Exchange I can’t have them run automatically. Any suggestions most appreciated. First congrats for a great job. Just one question when i go to view -> toolbars -> costumize i don’t have Macro :/ Can you help please? I am ruining on 2016, not getting any errors and getting correct list of rules in the message box, however the rules don’t execute correctly, nothing happens, emails don’t get moved. If I run the rules manually from manage rules, they run fine. but struggling to make it work. Anyone out there that can assist? Thanks for the reply.. I have tried to apply your suggestion but I am getting the debugging tool. Tried to move things around but may need to massage the code a bit.. Both the “Sub A_Run_All_Inbox_Rules()” and “Next” are highlighted. Below I have the script that is working well, but running all rules. And below that I have the correction with your suggestions. Is there anything that jumps out that looks off? Also – Sub A_Run_All_Inbox_Rules() is highlighted in yellow. Hi Jill, at a guess you haven’t converted the fancy ” ‘ ” ‘s (single quotes) into proper ” ‘ ” ‘s so its trying to parse it. Thank you!!! I’ve been looking for something like this for years. I appreciate the detail in this set of instructions. Note: I posted here back in 2016 but am now on a new machine and didn’t port anything over from previous machine so those posts can be ignored and are not related to this post. Thank you. Problem: While the macro runs (i can tell because I get both messages), nothing is actually executed (the rule is very simple, just changes a category, and works fine from rule manager). I stepped through and the “dim” commands are “skipped over.” very odd! Ok it didnt work for me at first, but that was because the rules are case and whitespace sensitive. what I did was. and checking the rule name. I saw the rule names appear, but they weren’t running, then I realized that my rule name was HoytRule but the rule was called Hoytrule. so would never run.